With the movement to virtual appliance versions of application delivery technologies, I find myself needing an expedient method for deploying the XenServer hypervisor. Normally I’d turn to the CD install, but I’m seeing fewer servers in the datacenter with CD ROMs. Using a USB key is an easier and more elegant approach. A few Citrix blogs suggested I needed Ubuntu and a long list of commands to get the XenServer ISO to boot from a USB key. 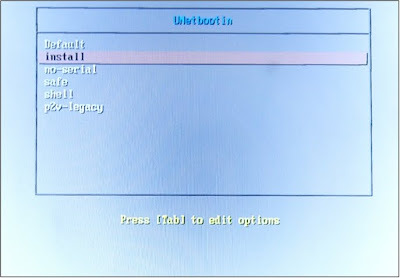 But I’ve found that there’s an easier way and it works from Windows; it’s called UNetbootin. 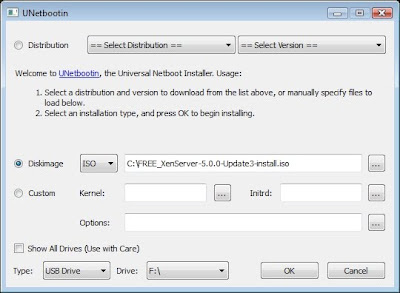 Select the appropriate ISO and USB Drive and hit OK.
Make sure your target systems BIOS is set to boot from a legacy USB device and insert the USB key.